The ETS Lindgren HI-2602 Interlock Monitor provides continuous surveillance of microwave fields for protection of personnel and equipment. The device accepts input from a single, remotely mounted sensing probe using the patented microwave field sensor. Usable in any critical area, the HI-2602 interlocks with any microwave source or alarm. 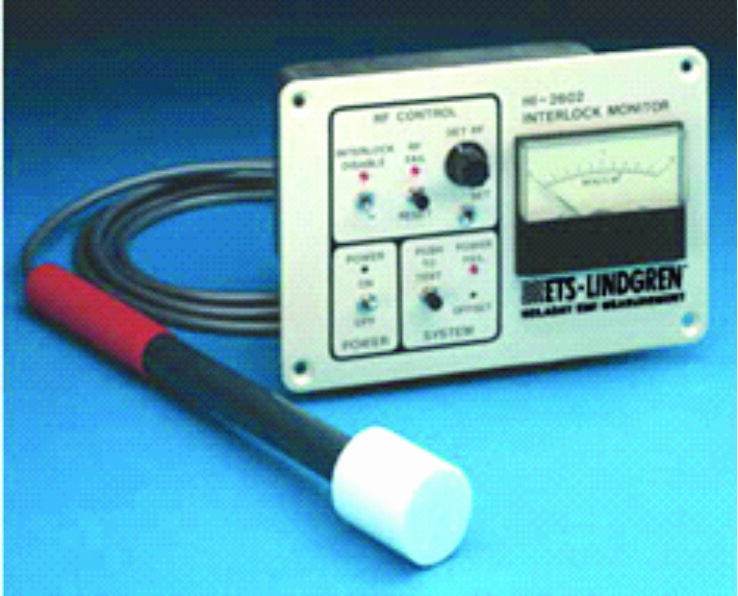 The instrument can be set to trigger at any RF level up to 2mW/cm2. An LED indicator illuminates, and primary alarm relay triggers, when the RF field exceeds the pre-set limit. The diode detection array is housed in the large end of the plastic probe, and has the unique feature of being able to sum microwave electric fields of any polarization in a plane perpendicular to the axis of the probe. The probe is attached to the main unit by a BNC connector, and the combined unit and probe are calibrated as an integral instrument.